The Raleigh Talus 2 mountain bike is all about the real fun on two wheels. It features a strong aluminum frame which is ready to cruise. 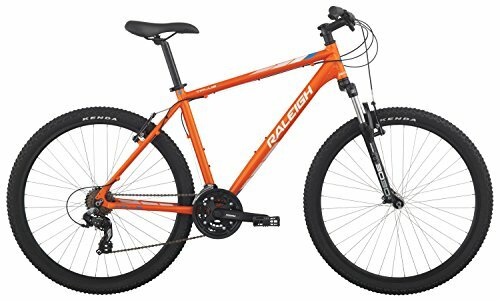 This Raleigh Talus 2 mountain bike has a Suntour suspension fork and burly 27.5-inch wheels which takes care of every pothole and bump on your way. Besides, the reliable brakes, the fire shifters, the Shimano 21-speed drive drain makes this bike very easy to handle whether you are cranking up a trail or cruising down a rough road. Just like most new mountain bikes the Raleigh Talus 2 is equipped with suspension. One great benefit of suspension is that it reduces the amount of beating your body takes. In case you are suffering from sore lower back or stiff neck on rides, you will be surprised by the differences the suspension makes. Furthermore, there are two kinds of suspension bikes, those with front suspension and full suspension those with both front 8 rear suspension. The Raleigh Talus 2 has a front suspension also called hard tails. The front suspensions bikes are known to be lighter and more efficient. That is why the hardtails dominate the cross-country racing scene. In addition, the Raleigh Talus 2 frames are simpler than those of the full-suspension models and this means they are easier to maintain and clean. The Raleigh Talus 2 is built of aluminum frame materials. This is the best material for the job. The reason to this is that it produces affordable, good-looking, strong, and lightweight frames that do not rust. Furthermore, the aluminum tube frames have incorporated more flex to conduct vibration conveniently making a bumpy trail bike riding more comfortable. With a proper design, aluminum frames can give you a solid ride for climbing and handling in tight situations. Besides, steel which has been a long-running workhorse is now being replaced more and more by aluminum, which has become cheap to both the manufacturers and the cyclists. The Raleigh Talus 2 has strong wheels which you can fully depend on. Unlike most traditional bikes, the Raleigh Talus 2 wheels are lighter as the reductions are noticeable on the trail because the wheels are rotating weight. This bike features large 27 5′ whiles and wide 2” tires that help you to easily roll over rocks and roots with confidence and efficiency. These wheels offer a middle ground between the standard 26” wheels and the 29” thus makes it best for both worlds, more easily rolling over terrain than the 26” wheels but more maneuverable than the 29” wheels. Raleigh Talus 2 comes with V-brakes. These brakes are very easy to use and lightweight. Mechanically speaking, they’re made up of a lever, a brake caliper, and a cable. This system is almost similar to a cantilever brake but the addition of a spring improves its progressiveness and the braking power. In addition, this type of brake style is relatively cheaper when compared to disc brakes. Maintaining the V-brakes is also easy to maintain you just need to change the cables and pads regularly. This brake style is widely used in cross-country races especially for the route portions that do not have mud or long descents. The saddles on Raleigh Talus 2 are excellent and most importantly, they are designed in a way that fits you properly. However, it is recommended that when you are purchasing the cheap mountain bike, give it a try and then see how it feels. You should also know that it might take a while for your body to get used to riding. For most people, performance is everything. When it comes to performance, the Raleigh Talus is top notch. It has less equipment making it lighter than suspension machines. This, in turn, makes them faster on both climb and flat terrain. The Raleigh Talus 2 review shows how reliable the bike is. It is well built, lightweight, and the type of shifters it comes with are a big deal. It is also excellent on pavements and trails and features an awesome front suspension. The tires are big but very lightweight and this makes the bike move very fast. If you are in need of a quality and an affordable bike, this is your best choice.